My fifteenth ground of 2018 was on Wednesday 9th May at the Wodson Park Sports Centre in Ware, Hertfordshire. The match was Wodson Park vs. Enfield Borough in Spartan South Midlands League Division One. The Wodson Park Sports Centre is at the northern tip of Ware - the complex consists of a leisure centre, four tennis/netball courts, a cage football pitch and two senior football clubs. 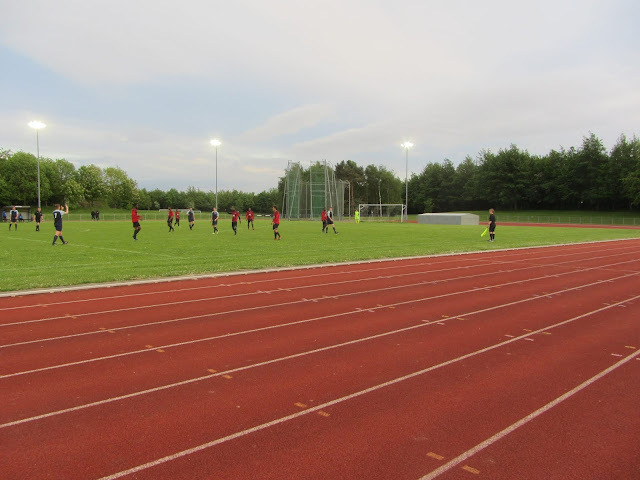 Ware FC play in a dedicated football venue while Wodson Park play on a separate pitch in the middle of an athletics track. As the complex is only just within the town's border it is surrounded by fields on all sides. The venue is 1.3 miles north of Ware railway station. The club was formed in 1997 and initially played at the athletics pitch before moving into Ware's stadium in 2009. Four years later they returned to the athletics pitch and have remained there since. The west side of the ground is the area with the most space. This backs onto the leisure centre which contains an upstairs bar that spectators can use during the interval. 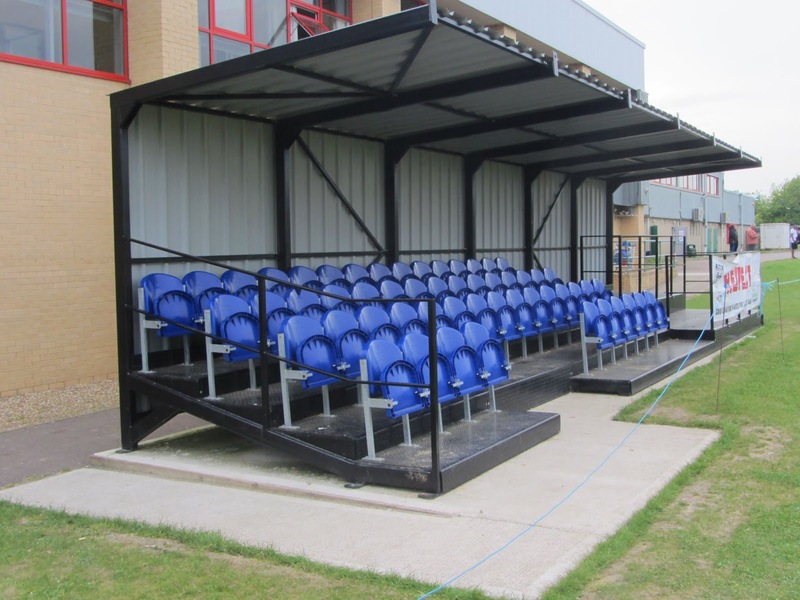 A 55-seat stand was opened in 2016 - just inside the southern half of the field this stand also has a section for standing at the end. Due to other the layout of the venue this stand is around 100ft from the pitch with a long jump area, a pole vault area and an eight-lane athletics track between it and the field of play. With this being such a long way from the action a number of spectators choose to watch from an uncovered standing area on the edge of the running track. The rest of this side is uncovered grass standing except for an access way at the back between the grass and the leisure centre. The west side of the ground is technically the only side within the confines of the ground. The rest of the venue is accessible but with the positioning of the barriers you would be outside the recognised ground area. The eastern side has the two dugouts at pitch-side with a grass bank behind the running track. The northern end has a steep grass bank running up to the cage pitch while the southern end is flatter in nature. This was the final game of the season for two sides in the top half of the table - with little riding on the tie the first half-hour of the game saw absolutely nothing of note occur as the play was bogged down in the midfield. The first decent chance of the game fell to the visitors in the 32nd min when a ball to the back post found a midfielder who fluffed his lines and sliced wide from close range. A couple of minutes after this an Enfield winger had a low shot cleared off the line. The hosts reacted to this close escape and a minute later almost took the lead when a ball into the box was controlled well and struck against the post by a Wodson winger. The home side didn't have to wait long for another chance though as they took the lead in the 36th minute - a cross from the right was missed by a defender allowing Oliver Babbage to smash the ball into the roof of the net from inside the six yard box. Wodson should have gone into half-time two goals to the good as Babbage played a nice one-two with a teammate but with just the keeper to beat he blazed over. Five minutes after the interval the chance of Enfield getting anything out of the game diminished when Sivi Bao received his marching orders after rugby tackling a Wodson striker who was clean through on goal. In the 55th minute the hosts went 2-0 up when a lofted free-kick picked out Jordan Halls who poked home from a couple of yards out. The game should have been killed off in the 62nd minute when a Wodson player got in behind the visiting defence but his poor finish saw the ball go wide of the far post. Just after this Wodson had a scare when Enfield were a whisker away from grabbing one back after a midfielder reacted well to a high ball and flicked the ball towards goal before the keeper could get it. The ball went just the wrong side of the post and this would be as good as it got for Enfield. The game was finally closed off as a spectacle towards the end of proceedings when Babbage grabbed his second of the game to round off a 3-0 win to consolidate 5th place in the league for Wodson.